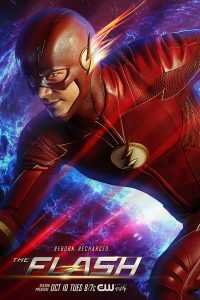 The fourth season of The Flash begins tonight at 8PM on The CW! 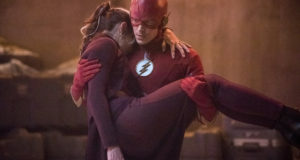 The network has made the first two episodes of the season, tonight’s “The Flash Reborn” and next week’s “Mixed Signals,” available to press, and we have some thoughts! Read on. 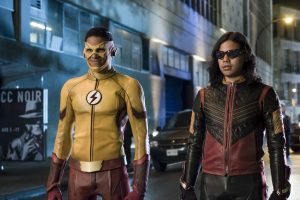 “The Flash Reborn” kicks off Season 4 with promises that the new year won’t be as dark and dour as last year’s downer season did. I admit, my love for The Flash waned a bit because part of what made the show so special was Barry Allen’s optimism. 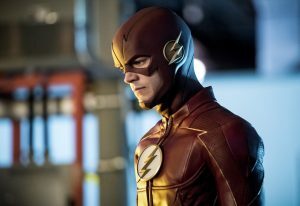 In tonight’s show, a villain comes demanding a battle with The Flash, and the team has to figure out what to do to stop him. Should they send Wally? Or… should they try to get Barry back? It shouldn’t be considered a spoiler that they do find a way to make it work… though the science of it all is really confusing, and things working out as they do is awfully convenient. While I am glad Iris has taken on a leadership role at STAR Labs, I almost wish she rather than Cisco was the one who believed that he was still alive and coming back. Candice Patton does, of course, do a great job with the material she is given, as is Carlos Valdes; I think I just wished Iris had been the one to believe all this time, that Barry always makes his way back. I also have to wonder: If they need a Flash to face this Samurai so badly, why not call up Gypsy to help them find a speedster Barry from another Earth? After all, they found a dozen different Harrison Wells? In a way, I’m glad the show stopped leaning on that “other universes” trope, but it still might’ve done the trick. All in all, “The Flash Reborn” gets all the pieces working again, but it’s the next week’s show, “Mixed Signals,” that’s more exciting to me. The second episode of The Flash Season 4 is more of the kind of Flash I want to see. Barry’s happy to be The Flash, and Cisco’s made him a new suit with some cool gadgets that weren’t revealed in the spoiler photos. There’s no time travel nonsense, and the only dimensional travel comes in the form of Gypsy. Barry has fun with his powers when he gets up in the morning with what might be one of the most amusing sequences of the show to date… but… something’s off. He and Iris need to talk. So they go to a therapist played by Donna Pescow! If anyone knows that love conquers all, it would be her. The best part of this is that finally, after four years of “brb gotta speed away,” Iris finally gets to say what’s on her mind. Meanwhile, the “dangerous meta” from the episode description is Kilg%re from the William Messner-Loebs era of Flash comics, and Cisco is having relationship problems of his own, all while getting advice from a certain female friend. Beyond the optimism, I love that Team Flash is back. The producers promised “back to basics” and I feel like that’s what’s happening here. There’s still a Wells-sized hole at STAR Labs but we’ll see when that gets resolved. 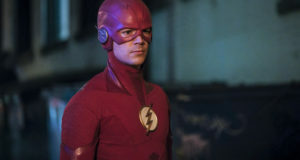 So… check out the premiere tonight to see how Barry comes back. But even if the premiere is not to your liking, stick around for “Mixed Signals.” It’s worth it. Join the countdown to tonight’s Flash episode on our Flash forum at KSiteTV!